Hello! Thank you for visiting my site! If you are here, you must be looking forward to a visit to St. Petersburg. If so, I am ready to make your time in St. Petersburg as remarkable as possible. 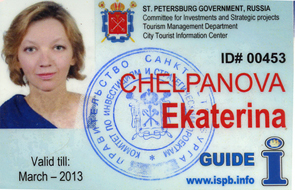 I am a licensed private guide in St. Petersburg, my name is Ekaterina Chelpanova, I can take a full responsibility for your visit to St. Petersburg. I can arrange and guide ALL your tours and also provide transport and tour tickets for cruise passengers. I can provide guided tours in English, Spanish and Russian. 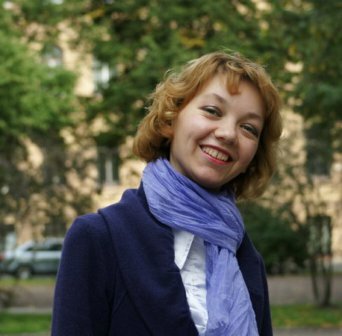 Why is it good to choose me as your private guide? I am ready to explain it to you right here! I have a diploma and PhD in history and art history, I know what I am talking about! Many guides use standard guidelines for preparing their excursions, but I am really into art and history, I hate standard insensate explanations and I can make art and history really tangible, lively and close to you. With me you will not only see more and learn more but you will never feel bored or overwhelmed by too much of art and culture. I can paint, write novels and articles about history, I enjoy sharing my feeling of art and culture with you! I am very experienced in what I am doing. I have worked with the clients of all types and I can feel what a particular person needs. I started guiding ten years ago and since then I have had only very good comments. I can promise you that after the excursion you will get a totally new concept of what Russia really is! I enjoy not only describing sights and art pieces, I believe that through art and culture I should give you the feeling of my country and its people! I believe this is what real tourism is all about! I promise that with me you will get an experience of Russia and St Petersburg you did not expect. If my guest says after the day “We did not expect Russia is so great!” I think that I’ve done my job well. You can pay for all services right on the place! No deposit is required. If you are travelling on a cruise and don’t have visa, you still CAN get off the ship and spend with me lovely time in St. Petersburg. I will be happy to answer ANY of your questions! Sometimes you want something that goes beyond . . .